Are you sure you want to remove Memoirs of a cavalier from your list? Memoirs of a Cavalier (Large Print Edition): A Military Journal of the Wars in Germany, and the Wars in England. From the Year 1632 to the Year 1648. Memoirs of a Cavalier: A Military Journal of the Wars in Germany, and the Wars in England. From the Year 1632 to the Year 1648. 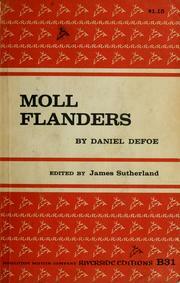 Memoirs of a cavalier: or, A military journal of the wars in Germany and the wars in England. Memoirs of a cavalier...: edited with an introduction by James T. Boulton. 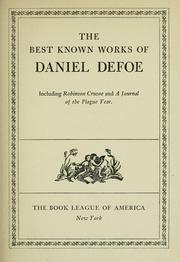 Memoirs of a cavalier: or, a military journal of the wars in Germany, and the wars in England. [Memoirs of a cavalier: or, A military journal of the wars in Germany, and the wars in England; from the year 1632, to the year 1648. Memoirs of a cavalier. 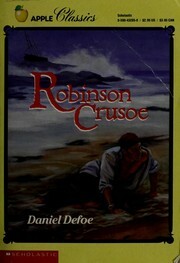 : Printed from the first edition. 1908, J. M. Dent & co.
Memoirs of the honourable Col. Andrew Newport ...: containing anecdotes and characters of the principal persons ofthat time. The whole forming a complete military history of Germany and England towards the middle of the seventeenth century. 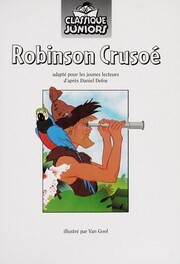 in English - New ed., with additions. 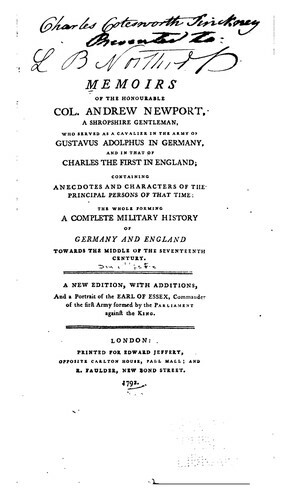 Memoirs of the Honourable Col. Andrew Newport: a Shropshire gentleman, who served as a cavalier in the army of Gustavus Adolphus in Germany, and in that of Charles the First in England; containing anecdotes and characters of the principal persons of that time. The whole forming a complete military history of Germany and England towards the middle of the seventeenth century. 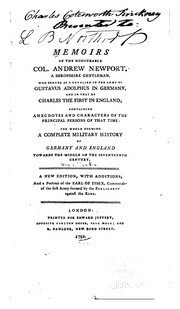 Memoirs of the Honourable Col. Andrew Newport: a Shropshire gentleman, who served as a cavalier in the army of Gustavus Adolphus in Germany, and in that of Charles the First in England ... the whole forming a complete military history of Germany and England towards the middle of the seventeenth century. in English - A new ed., with additions, and a portrait of the Earl of Essex. Memoirs of the Honourable Col. Andrew Newport: a Shropshire gentleman, who served as a cavalier in the army of Gustavus Adolphus in Germany, and in that of Charles the First in England ... The whole forming a complete military history of Germany and England toward the middle of the seventeenth century. in English - Anew ed, with additions, and a portrait of the Earl of Essex. A military history of Germany, and of England: from the year 1631, to the year 1648. Being the memoirs of an English gentleman, who served in the army of Gustavus Adolphus; and afterwards in the royal army of King Charles I.
Microform in English - [Fourth edition]. Microform in English - [Second edition]. Memoirs of a cavalier: or, A military journal of the wars in Germany, and the wars in England, from the year 1632, to the year 1648. Written threescore years ago by an English gentleman, who served first in the army of Gustavus Adolphus, the glorious King of Sweden, till his death; and after that, in the royal army of King Charles the First, from the beginning of the rebellion, to the end of that war.